Far infrared sauna emits far infrared waves to detoxify the body, assist with weight loss and provide pain relief from muscular injuries. They have also been clinically shown to lower blood pressure. Detoxification: Sweating is the body’s safe and natural way to heal & stay healthy. 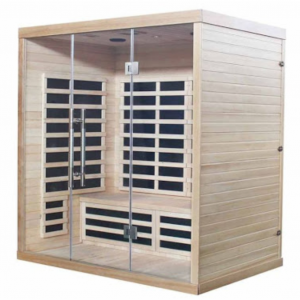 Far infrared sauna benefits the body by heating it directly causing a rise in core temperature resulting in a deep, detoxifying sweat at the cellular level, where toxins reside. Relaxation: Unlike traditional saunas which operate at extremely harsh temperatures, infrared is a gentle, soothing and therapeutic heat that promotes relaxation and improved sleep. Infrared sauna benefits include therapy that helps you relax while receiving an invigorating deep tissue sweat, leaving you fully refreshed after each session. Lower Blood Pressure: Far Infra-Red saunas induce a deep sweat to make the heart pump faster, which in turn increases blood flow, lowers blood pressure and helps circulation. Scientific evidence shows the infrared sauna benefits using an infrared sauna a couple times a week lowers blood pressure. Weight Loss: Studies have shown that an infra-red sauna session can burn upwards of 600 calories while you relax! As the body works to cool itself, there is a substantial increase in heart rate, cardiac output and metabolic rate, causing the body to burn more calories. Pain Relief: Infra-red heat penetrates tissue, joints, and muscles to relieve anything from minor aches and pains to chronic pain conditions such as fibromyalgia. Pain management professionals incorporate infrared heat therapy into treatment plans to decrease pain and muscle spasms and to speed up recovery time. Improved Circulation: Heating the muscles with infrared rays produces an increase in blood flow similar to that seen during exercise. Regular infrared sauna use—especially in the mid infrared range—can significantly stimulate blood flow up to twice the normal rate. Wound Healing: Scientific research has concluded that near infrared therapy greatly enhances the skin’s healing process by promoting faster cell regeneration and human tissue growth. Human cell growth increases to repair wounds and prevent infection. Cell Health: Infrared therapy stimulates the circulatory system and more fully oxygenates the body’s cells. Better blood circulation means more toxins flow from the cellular level to the skin’s surface to improve cell health, aid in muscle recovery and strengthen the immune system.